Live Streaming is now a $10.1bn industry globally and is expected to reach $13.1bn with over 19 million creators projected to live stream in 2019. A large chunk of this pie is made up of game streamers on Amazon-owned streaming service Twitch, closely followed by YouTube and Facebook. Games like Fortnite, Playerunknown's Battlegrounds (PUBG), League of Legends, Call of Duty: Black Ops 4 and more are raking in extraordinary numbers in terms of hours streamed. According to popular streaming software provider Streamlabs, Fortnite was streamed for upwards of 18 million hours in Q4’18, while PUBG was live streamed for upwards of 3 million hours the quarter before. 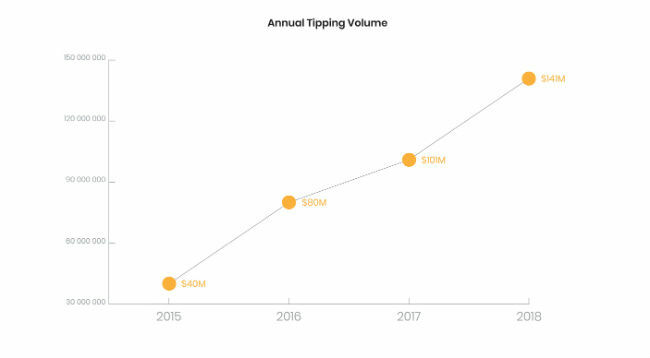 The numbers are even rosier for mobile game streaming, which is also contributing to the growth in annual tips and donations made by streamers around the world. “PUBG has about almost 10 million daily active users in India. About six months back it was around 5 million,” Ashwin Haryani, Co-founder of popular Indian eSports organizer GamingMonk tells Digit.in. In online gaming and live streaming, PUBG, specifically, has taken the country by storm. 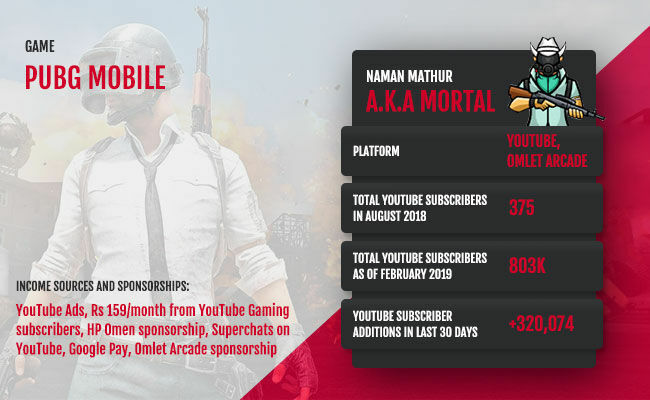 While trends in the west favour Fortnite, the battle royale genre for India has come to be defined by PUBG (both Mobile and PC), so much so that gamers are making entire careers on the back of the game. “The whole concept of professional streaming as a career took off only a year-year and a half back,” Vamsi Krishna, Head of Consumer Marketing (South Asia), at NVIDIA tells Digit. Nvidia, like many other hardware and technology giants in India’s gaming landscape, sponsors budding PUBG game streamers in the country. “In India, the whole industry is led by mobile gaming, followed by PC and Console gaming. Mobile gaming has taken the lead in terms of getting close to 250 million mobile gamers in the country. The good news is more and more people playing on mobile platform enables us to get gaming as an accepted phenomenon in the average household,” Krishna explains with reference to the growing popularity of mobile as a gaming and streaming platform. Favourable trends like these are making more and more gamers want to jump on the PUBG streaming bandwagon, and a lot of them are zeroing in on some serious moolah with their skills. Speaking to Digit.in, Rahul Pandey A.K.A GoldyHindiGaming says, “Before PUBG I had around 17K subscribers on YouTube. 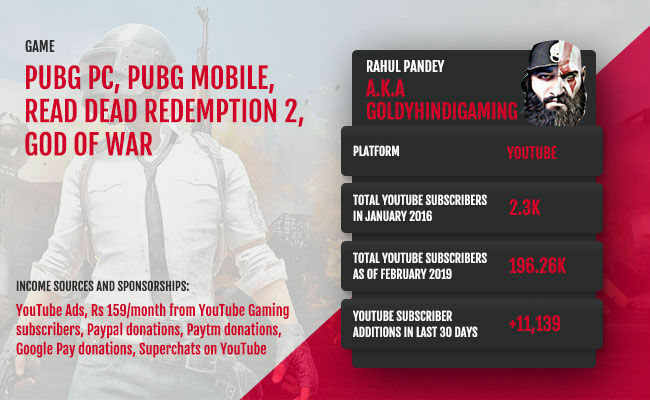 As soon as I started streaming PUBG Mobile, it took me 50-60 days to reach around 70K subscribers.” Pandey, who has been a gamer since he was 7 years old, was quick to capture Hindi live streaming audiences. 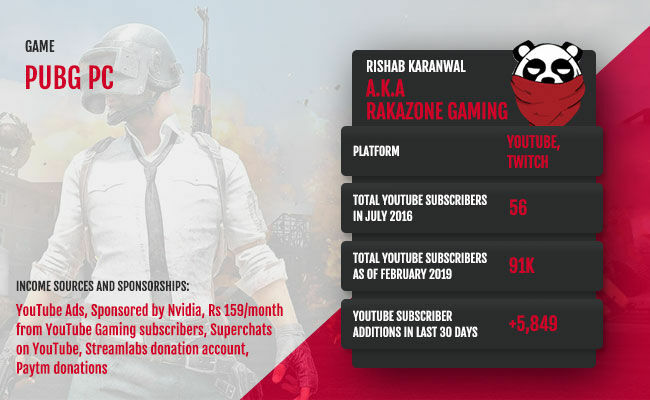 His PUBG game streams in Hindi have earned him almost 200K subscribers on YouTube, which happens to be the medium of choice for Indian game streamers. 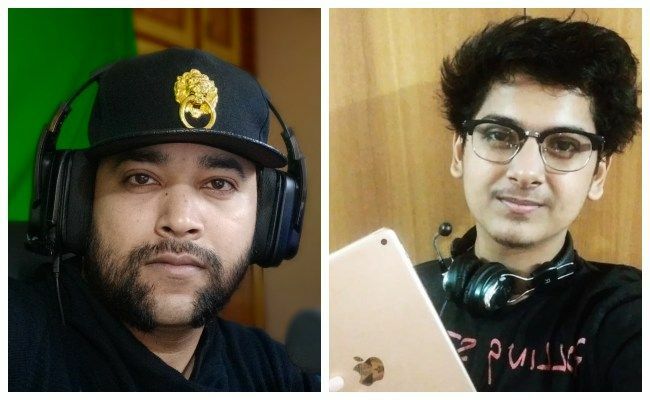 “Rishab/RakaZone Gaming has a full-time job in the day in an IT company and evening he comes back and streams from 8PM - 10-10:30 PM. 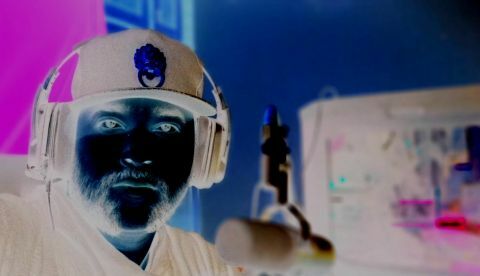 He has a dual revenue stream right, he makes money out of streaming and he makes out of publishing. Xyaa quit her full-time job and went into professional streaming,” says Krishna, emphasising on the fact that even though professional game streamers are not in the hundreds of thousands in India, the last year has seen a phenomenal rise in gamers choosing streaming as their sole career thanks to PUBG. 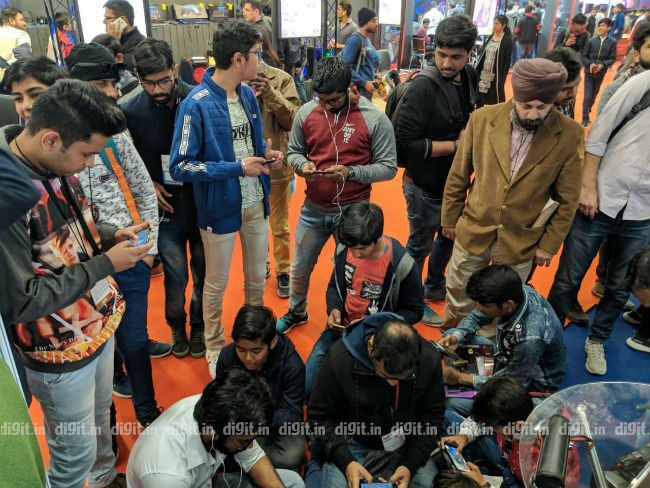 In India, game streaming is synonymous with YouTube Gaming, while platforms like Facebook and Omlet Arcade are also picking up after Google’s legacy video streaming portal. “In India at the moment. YouTube has maximum number of streamers streaming at the moment. Facebook Gaming has picked up in the last few months," says the NVIDIA exec. “I am from a middle-class family and I do not have my dad. My dad passed away when I was four. Any income from this field was very helpful for my family. At an average, I earned around Rs 1 lakh for the first few months. It has actually helped me a lot,” says Mortal who is now contributing to his household income. 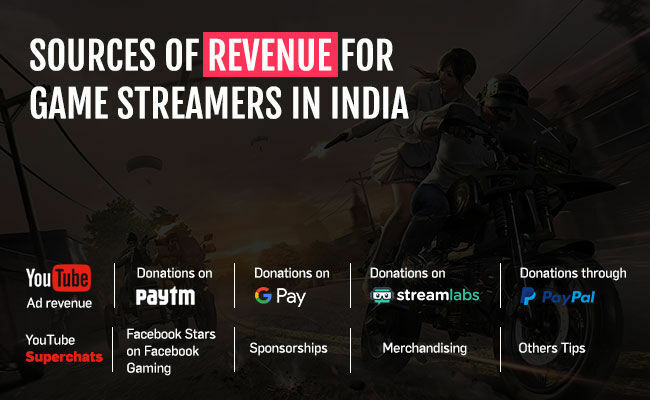 Pandey from GoldyHindiGaming did not disclose his earnings, present or past, but tells us that streamers with good skills and a penchant for entertainment can expect to start earning anywhere between Rs 45,000 - Rs 50,000 within the first few months of streaming PUBG. And, this is only the ad revenue one can expect to churn. Sponsorships and other avenues add to this income greatly. “The funny part is that what we’ve noticed that people on Jio (Reliance Jio) generally get 1-1.5GB data free per day right, so these guys watch the stream till 12PM, drop off for a minute, and as soon as they get data, they then come back again, because their data refreshes for the day. That's a really cool thing that we noticed and we divide our streams between 12 o'clock equally,” Says Haryani. Both Mortal and Goldy also prefer evenings for their streams, but feel the hours can be flexible as long as consistency is upheld by streamers. “You get this feeling from inside that you can do it. I didn't go to anyone, I didn't reach out to anyone. It was my hobby and I thought, oh man, I can earn a few bucks out of this, buy some peripherals. So if you have the skill, then you must go and reach out for that passion. It will take time. If you want to get good, practice or watch someone who is better than you. Try and build an audience around PUBG Mobile. Start with it. There won’t be any shortage of viewers,” says Pandey from GoldyGaming.